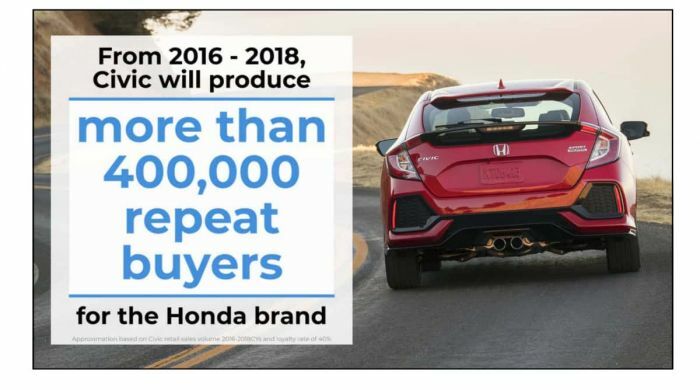 Honda is committed to continuing to build better cars each year. Meanwhile, General Motors, Ford, and Dodge/Chrysler are quitting on cars in America. Why isn't Honda quitting cars? Simple; because cars are the cornerstone of Honda's business. Here is some insight that Honda shared with the New England Motor Press Association this week. "The Accord and Civic are the foundation of Honda's business." This according to Sage Marie, Assistant Vice President of Public Relations at American Honda Motor Company. In a very detailed presentation hosted by three Honda employees and backed up by a representative from Cox Automotive the research and data company behind the sites we all trust like Kelly Blue Book and Autotrader, Honda laid out the facts on why cars matter. Most of the presentation focused on the Civic. Honda is introducing a refreshed new Civic for 2019 with some important new changes. This, as the Focus from Ford, Dart from Dodge, and the Cruze from Chevrolet are all now discontinued. Honda explained that the Civic is the top-selling retail car in the country. Retail meaning not including stripped-down fleet vehicles sold to rental car and other types of fleets. Sales are important, but there are other even more important reasons why Honda is sticking to cars. Consider entry sales. These are sales to first-time buyers of new cars. Among the millennial's generation, Honda's Civic is first in sales. 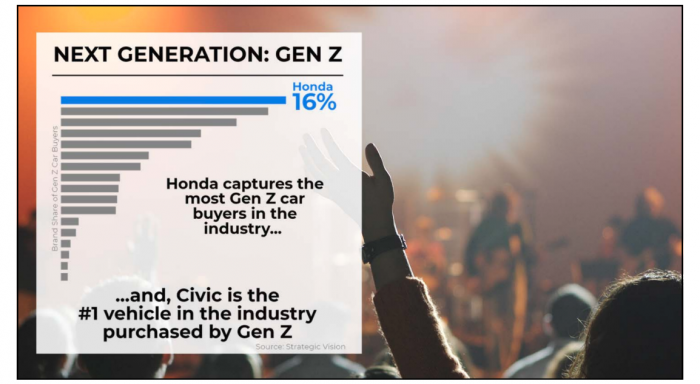 Honda's Civic is also first among Gen-Z buyers. Bringing in new young buyers is vitally important to every automotive brand. However, repeat sales are really what the automakers are after. Here Civic is again number one. Honda estimates that it sold 400,000 vehicles to former Civic owners over the past two years. The Civic is also not just out-selling cars. It outsells all of the top-selling crossovers in the American retail market as well. The Civic is the top-selling retail vehicle overall in America with two exceptions; The Ford F-series and the Chevy Silverado pickup trucks. As GM, Ford and other brands continue to abandon cars, Honda America's Civic remains the cornerstone of its brand. Yeah, I have been saying that it is a familiar and dark road that the domestic automakers are heading down AGAIN. It happened in the 80s, and again in the 90s, and again now. German, Japanese, and now Korean and soon Chinese automakers have taken a huge chunk of the U.S. auto market by simply building better, economical small cars. Chrysler and GM teamed up with asian automakers in the past, and Chrysler continued by teaming up with Daimler/Mercedes, and Fiat now. Or rather those companies bought the brand to sell their rebodied cars as domestics in the U.S. Personally I've owned several Hondas, including 7 Civics over the years. And they are simply great cars, being well engineered, practical and sporty, economical and reliable, with good resale value. I have to say that the 2013 Civic was getting bland and even the reliability and build quality faltered. But then Honda regrouped and did a great job on the redesigned Civic and Accord, which has paid of well for Honda in soaring sales. Frankly I think that the Focus, Cruise, and Dart were good, competitive compact car designs, but once again the American automakers, driven by the higher short-term profits of their SUVs and trucks have given up the small car market to the imports. Kudos to Honda for staying the course and improving their mainstay Civic, which is rewarding their efforts today and in the future.